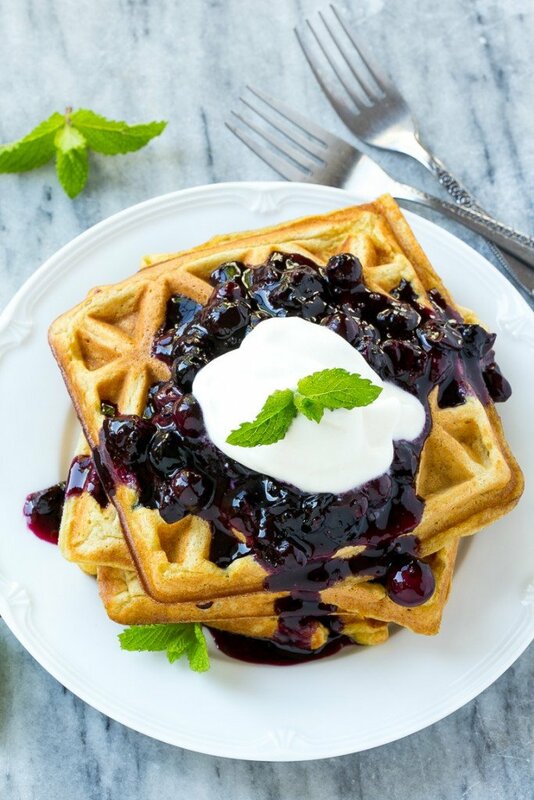 This recipe for oatmeal waffles is a breakfast delight of light and fluffy waffles topped with a homemade blueberry compote. There’s a secret ingredient that adds a boost of nutrition! Before I had kids, I didn’t really understand the whole picky eating thing. 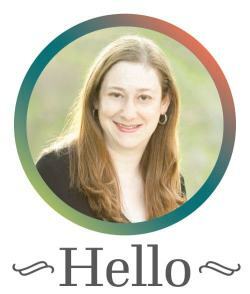 I figured if you fed your kids a wide variety of food, they’d become adventurous eaters. Then I had my three girls and I learned that I was completely wrong. My girls all had strong food preferences from the first day I put a spoonful of baby food into their mouths. My toddler Audrey is particularly challenging to feed so I’ve taken to adding nutrition to her food whenever I can. These oatmeal waffles are fortified with my secret ingredient – Gerber Oatmeal Cereal! The adults love these waffles as much as the kids do, in fact, I’ve made them twice already this week. I buy my Gerber cereal at Walmart, and while I typically use the Oatmeal Single-Grain Cereal for this recipe, the Multigrain Cereal would also be great. I love that the cereal is fortified with iron and vitamins, it helps me get a little extra nutrition into my picky eaters. 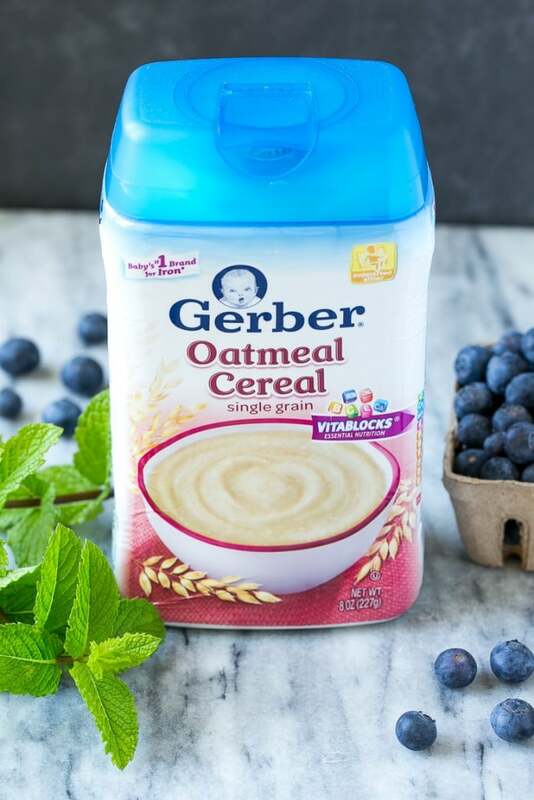 Gerber cereal is not just for babies, in fact, it’s perfect to use in recipes – think pancakes, waffles, crepes, muffins and more. 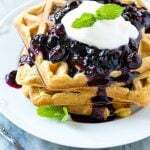 So let’s talk a little more about these waffles – I used my favorite waffle recipe, but substituted part of the flour for Gerber Oatmeal Cereal. I have to say, I think I actually prefer this recipe with the addition of the cereal, the oatmeal added a nutty flavor that was more complex than your traditional waffles. The homemade blueberry compote really takes these waffles over the top. The blueberry compote is essentially fresh blueberries cooked with a bit of sugar. I prefer fresh blueberries for the sauce, but frozen berries will also work in a pinch. 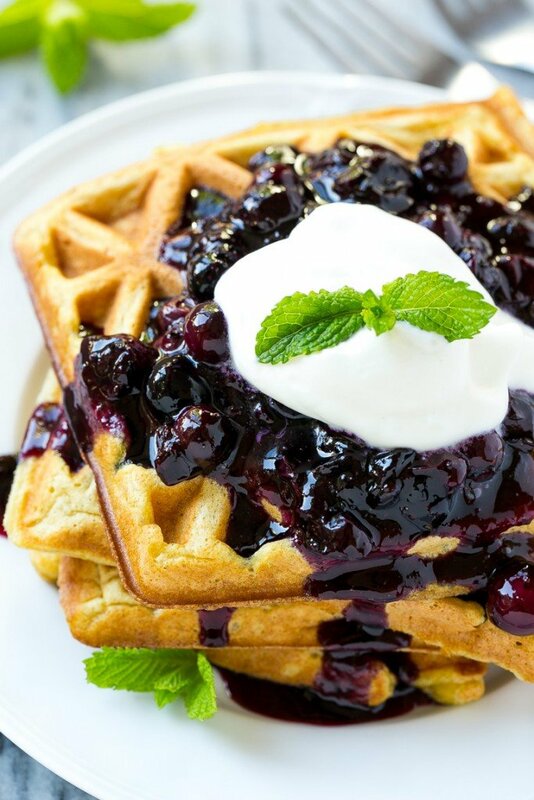 Add a generous dollop of blueberry sauce on your waffles, top with a bit of vanilla yogurt (or whipped cream!) and breakfast is served. I often make a big batch of these oatmeal waffles and then put the leftovers in the freezer, it’s so convenient to have frozen waffles on hand to heat up for an easy breakfast. I’m giving away $50 to one lucky reader, you can enter by filling out the form below. Good luck and happy cooking! 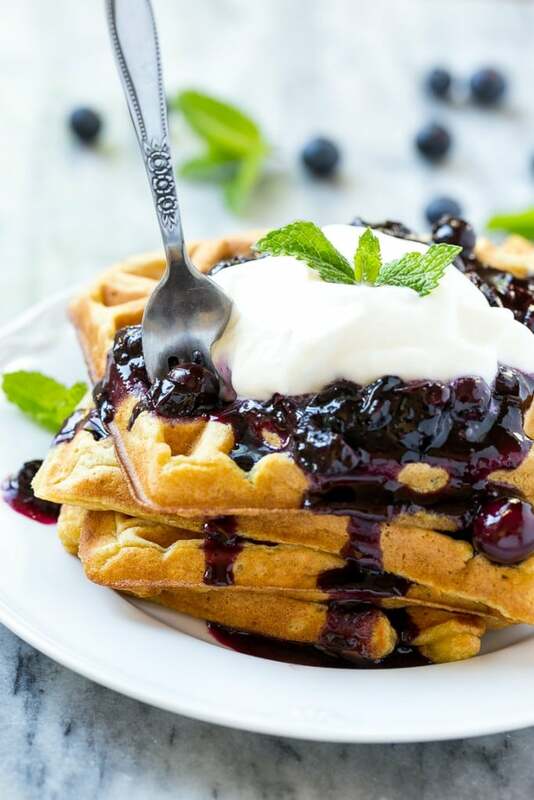 This recipe for oatmeal waffles is a breakfast delight of light and fluffy waffles topped with a homemade blueberry compote. There's a secret ingredient that adds a boost of nutrition! In a large bowl mix together the oatmeal cereal, flour, sugar, baking powder, baking soda and salt. Add the milk and eggs and stir until just combined. Add the butter and stir for 30 seconds more. Spoon 1/3 cup of batter into the wells of your waffle maker and cook according to manufacturer directions - these waffles cook for 5 minutes in my machine. Repeat with remaining batter. Combine 2 cups of the blueberries, sugar and lemon juice in a pot. Place the pot over high heat, boil for 3-4 minutes or until blueberries have just started to break down. Mix together the cornstarch with 1 teaspoon cold water. Add the cornstarch mixture to the blueberries and boil for 1 additional minute until sauce thickens slightly. Remove from heat and stir in the remaining cup of blueberries; set aside to cool. 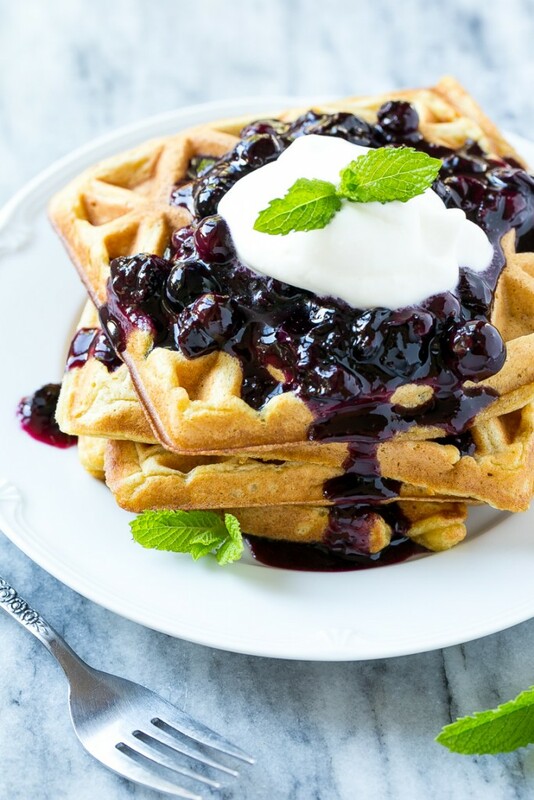 Serve the waffles topped with the blueberry compote and vanilla yogurt or whipped cream if desired. Garnish with mint sprigs if desired. I try to keep meal times stress free, so they feel comfortable trying new things. Those look delicious- I know we would all love those! We like to incorporate having fun with cooking our meals. We liked to let the little ones help and contribute to cooking. I also do sneak things either blended, pureed, or shredded into foods that I know they do enjoy! Serve everything with “dip” – which can be yogurt or hummus. Kids love dipping fruits and veggies. Making foods look fun helps – like cutting into fun shapes, or making things look bright and colorful. I say get one of those cookbooks that have recipes on how to sneak vegetables into foods without the kids knowing about them! Um, looks DELICIOUS. 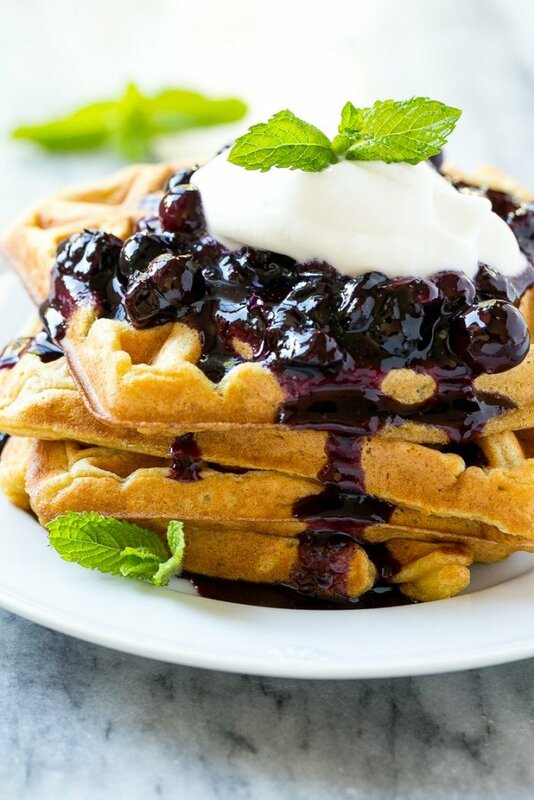 I love waffles and love adding blueberries to my breakfast. This one specially is one I would love to be eating right now! How did I miss this recipe??? So pretty and that blueberry compote is calling my name. You are so creative! I often hide good for you greens in smoothies for my grandson – yummy! My tip is to try making smoothies and mix in veggies and fruit. I hide a lot of good things in tasty smoothies! I like to incorporate fruits in smoothies or yogurt. Adding vegetables is hard though. I usually just make a roast or casserole and hope every one likes it. I always bribe by saying there will be dessert after.